This entry was posted on November 12, 2013 by Jessica Anderson. The week before last my blog topic was about Making Sports Trophies Meaningful. This week I’d like to touch on corporate awards and how to make a memory in the workplace that lasts a lifetime. 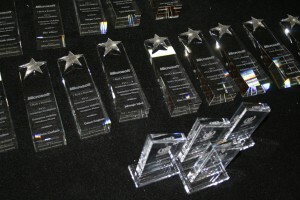 Not only are these crystal awards beautiful, but they represent the success and hard work of the recipient and company. The corporate awards season begins soon. Many companies and organizations will be ordering End of the Year Awards, Employee of the Month Plaques, Sales Awards, President’s Awards and so on. Below are some ideas for making your corporate award as meaningful to the recipient as possible. Last year, a friend told me a story of an award her husband received at his work. He worked extremely hard during the poor economy to reach his quota, and ultimately was a top sales person in his department. He received an award, and it was mailed to his desk at work. That was it. No words. No thanks for a job well done. No peer acknowledgement. Even though the award was a lovely crystal trophy and probably cost the company a fair deal of money, it lacked the effect that it was designed to do – to motivate and to recognize. In fact, it did the exact opposite, as her husband was rather mad that management in the company didn’t acknowledge his extra effort. Since then, he has moved on to another job within the organization. Don’t let this happen to your company! Don’t lose good people because they weren’t recognized for extraordinary contributions to your organization. If you go through the work to set up an awards program and the time and expense of ordering awards, be sure to follow through on the presentation. This is what really makes an award meaningful and shows true appreciation to the employee. Step 2: Choose your engraving wisely. What you say on the award has an impact. Be sure to spell the person’s name correctly. For ideas, read a past post on What Should My Engraving Say. - Make it a crowd. Whether at a gala or a team meeting, be sure to include other staff at the presentation. Acknowledgement in front of peers has two benefits. It increases recognition value for the award recipient and it also motives others to strive for the award in the future. - Bring in the VP. The award should be presented by a senior level person in the company. It means more when coming from management, as it shows caring and buy in from the upper echelons of the organization. - Timing is important. Present the award as close to when the achievement was earned as possible. The longer you wait to present, the less impact the award has. Especially with our instant-gratification-social-media society, fast action is important. - Pronounce the person’s name correctly. Basic, but this small detail matters. - State how the award was earned. Discuss what the person did to help the organization and how that’s important to the overall mission, vision and goals of the company. - Keep it brief. With awards presentation, less is more. Keep the speech to the point yet heartfelt. Awards earned at work are something the recipient will cherish for many years to come. Often they represent a defining moment in an employee's career. Make the accomplishment count by going the extra mile to plan ahead to make it meaningful.